• Why should you detoxify? • How do you know if you need to detoxify? • How will detoxification work? • How do you start a detox? • How to detox your whole body? • What are the natural foods for detoxification of various organs? • How to detoxify your body from drugs? • How to detox the body for weight loss? It is the method of removing substances that are toxic to the body, mainly physiologically done by the liver. In some cases, it also refers to the removal of ingested poison or drugs taken for long-term from the body and get to the normal body composition and function. Removal of toxins from the body: As we are exposed to so much of chemical and pollution, there happens an accumulation of these toxic substances which need detoxification. To keep chronic diseases away: These accumulated toxins can cause some severe effects on various systems. Though the liver does its work but is continuously overloaded and to help it, outside detoxification is essential. To lose weight and increase metabolism, thus keeping away diseases. Slowing down premature aging, thus aesthetically beneficial. Improve the overall functioning of the body. To get physical, emotional and mental peace. This also improves sleep. To balance the various systems of the body. Since the liver does its own work of detoxifying, we almost always overlook what our body is trying to say. If you notice the following, then you may need to consider detoxification. Any coating on tongue (white or yellow) with or without halitosis. Increased fat in the stomach or other areas. Change in blood sugar levels. Gallbladder issues or its removal. Bloating or other abdominal or gastric issues. Withdrawal symptoms like dizziness, slurred speech, etc., (in case of substance abuse). It will provide rest to the organs of the body by fasting. Blood circulation will be improved. Liver stimulation to remove the toxins. Also, organs like intestines, kidney, and skin will help to remove the toxins. The body will again be filled with an adequate amount of healthy nutrients. Detoxing is a very simple and natural method. You do not have to put in some really extra efforts as it may sound. The basics of this revolve around hydration, exercise and eating healthy. Thus, reducing the load of toxins. How to detox your whole body? Stop taking coffee, alcohol, saturated fats, refined sugars, cigarettes, and any other toxic product that can delay the healing process of the body. Avoiding any product that is for a topical application like beauty products and any chemical-based household cleaners, etc. Eating healthy foods and drinking a lot of water. Fiber consumption: Take high fiber content in diet including brown rice, fresh fruits, and vegetables that are grown organically. Beetroot, cabbage, broccoli, radish, seaweed, spirulina are really beneficial in detoxification. Drink plenty of water. You can take 500 ml water soon after waking up, at least 1 to 2 liters of water a day. Preferably use stainless steel containers (bottles to carry water). Cleansing and helping the liver to boost its detoxification effect by consuming green tea, milk thistle, burdock, etc. More of Vitamin C consumption. Practice breathing slowly. This will help in better circulation of air within the body. Be positive. This will also help in reducing stress. Sweating (in the sauna) can help you evacuate toxins via perspiration. Brushing softly to cleanse your pores and remove dead cells from skin. Hydrotherapy can help you relax. You can do it by taking a hot shower for five minutes followed by cold water for 30 seconds and get into bed for 30 minutes. Exercise, do yoga or skipping daily. What are the natural foods for detoxification of various organs? The main organ for detoxification can be boosted by consuming bitter foods, and foods that facilitate the production of internal antioxidants, and glutathione. Salad greens and green apple. This works by exhaling carbon dioxide and inhaling adequate oxygen. Sound sleep and breathing exercises are beneficial. You can take the following foods (more of the ones with spicy flavors, smell, and textures) along with it. Foods that are lacto fermented, like kimchi, apple cider vinegar, etc. Root vegetables like beetroots, turnips, etc. green tea, orange juice, beetroot juice, fruit smoothie ( fruits rich in fiber, antioxidants, vitamins, and mineral), vegetable smoothie and, green juice (broccoli, spinach, kale). How to detoxify your body from drugs? Evaluation: The patient is evaluated for the specific drug and its concentration in the body along with drug history and symptoms, and any associated disorders. Stabilization: The patient is explained about what will be done during the process of detoxification and what effects can be expected during and after the process. This can be done with or without drugs but the former is more commonly used. Guiding the patient into treatment: Sincedetoxificationprocess is physical, in this stage, the patient is guided and motivated to join a drug rehabilitation programme. Rapid detoxification is to use heavy sedation along with opiod antogonists but is expensive, highly dangerous and ineffective and hence, not preferred. How to detox the body for weight loss? 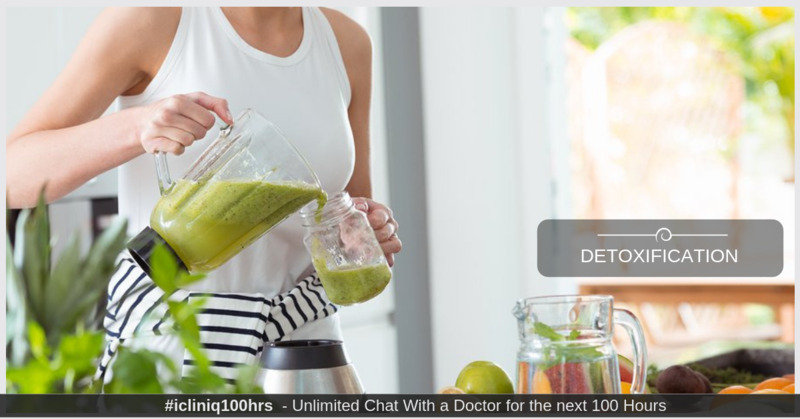 Though the above-mentioned methods will help in weight loss through detoxification, some of the major methods to specifically cause weight loss via detoxification are drinking adequate water, exercise, good sleep, avoid toxins and unhealthy foods, drinks, and habits, have a good sleep, reduce stress and anxiety, sweat out, and follow natural detoxification programme twice a year. Detoxification is a very beneficial process, especially when done naturally. But still, consulting your physician (chiropractor preferably) can help you to decide and guide the best detoxification programme, methods, and duration that will suit you and give you the desired effects. With the help of online medical platforms, it is quite easy to consult your doctor online with all your queries and get informed about the details that you want. Do you have a question on Anxiety or Stress?